I’ve not really been into the competition-entering Thang this past year. 2010, as some of you know, was very busy and stressful. I did try. I abandoned a few stories that ran out of time (one soooo near to completion that I’ll send it elsewhere, soon). But then, almost on a whim, I entered a poetry competition. Again. Even though I am Not A Poet – as I have explained to my OU tutor, the witty and wonderful Caron Freeborn. 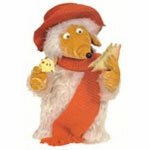 (Particularly wonderful today as she has granted me an extension for my assignment – backache has me doing the Womble Walk if I sit for more than a few minutes). The competition? Writers’ News, August. The brief? The theme: Generation Gap. Now I know what you’re thinking. I should be doing the Happy Dance. Can’t. Bad Back, you know. shortlisted Again…I should be delighted…but wouldn’t it be nice to, ahem…win? Wouldn’t one win be more heartening, more impressive to editors, agents & the literati in general, than four shortlistings? So tell me – d’you see my point, or am I just an ungrateful whinger? Oh – and just to make up for no posts for ages, straight after I post this one, I shall dip into my drafts and drag out one that needs to see the light of day. Need to stand up. Maximum sit-down exceeded. Womble walk, here we come.